You can’t control what other people do on the road. But you can be prepared for careless drivers and dangerous situations! Affordable and convenient, Safety-Ed™ online Defensive Driving, Traffic School, and Driving School Courses are backed by 35 years of experience in driver safety education. Easy to use and self-paced, you can switch between English and Spanish instruction and listen to our Internet audio versions. Get started today! To begin, just click Get Started. Have your driver’s license, traffic ticket (if applicable) and credit card, debit card or checkbook ready. As many reasons as there are drivers. Maybe you’d like to save on your auto insurance, reduce a fine or erase a traffic ticket from your driving record. Maybe you just want to be a better driver, for your safety and that of your loved ones. Whatever your reasons, Safety-Ed™ Defensive Driving, Traffic School and Driving School Courses from SAFETY-USA® can help - you can complete your course in less than one hour an evening for one week! Completing lessons is a snap! We’ll explain it all in the Course Introduction. To see how easy it is, click Show Me. Save $$$. You can save money several ways by completing a Safety-Ed™ Course—it’s cheaper than most traffic fines. A dismissed ticket is often erased from your record for insurance purposes - keeping your rates lower; discounts may also be available. Enjoy insurance discounts. Many insurers offer discounts of up to 10 percent or more on your auto insurance when you complete one of our Courses. Plus, your discounts may continue up to three years or longer. That can save you hundreds of dollars! Click here for affordable Course prices. We can help erase your ticket. Reduce a fine & erase a ticket. When you complete a Safety-Ed™ Course, you’ll have a Certificate of Completion that you can file with the court to reduce your fine and erase your ticket from your record. Drivers who haven’t taken a driving safety course within the past year to 18 months are generally eligible, depending upon where they reside. If you’re not sure whether your ticket can be erased, contact the Court where your ticket was issued. In your own home. At your own pace. Get started today! Just click on Get Started to find the right Course for you and enroll. Our simple registration process will help you select the Course and help you receive your certificate as quickly as possible. We accept all major credit and debit cards, money orders or checks. Money-back guarantee. Our flexible, no risk refund policy allows you to obtain a full refund up to three days after you enroll in one of our Courses if you decide for any reason not to complete all of the lessons – no questions asked & no risk to you – check your Enrollment Agreement for details. Easy, self-paced, anytime. 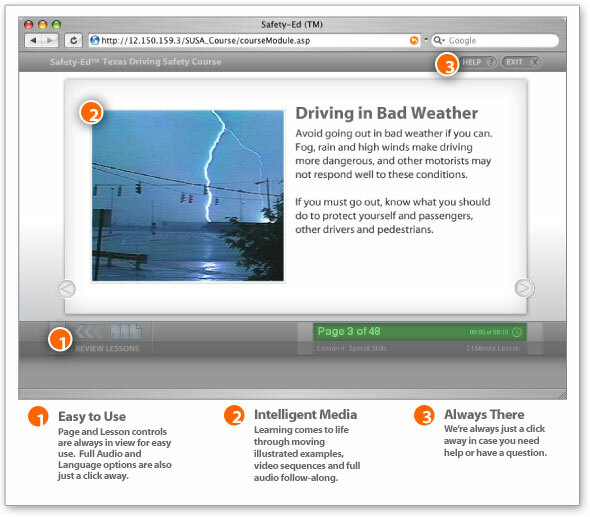 Thousands of drivers havefound that Internet-based courses are superior to the traditional classroom experience. Safety-Ed™ lets you learn in your home, whenever it’s convenient, and at your own pace—for up to 90 days after you enroll. You can log on at any computer with Internet access. Safety-Ed™ special features. Click on the Language icon in the Course to change between English and Spanish instruction. Use the Audio icon (in both languages) to listen to the Course as you go – we also have TDD support & transcribed audio for the hearing impaired. We know of no other driving safety course that offers this flexibility! Interactive to make learning fun! Our educational games and celebrity appearances can make the learning experience more enjoyable. You can take as much time as you like beyond any minimum times that may be required by the State or Court. You don’t have to complete a lesson all at once, and you can go back and review lessons as often as you like. Short multiple-choice quizzes after each lesson are designed to help you learn. And, there’s a Final Quiz at the end of the Course. Don’t worry— the Final Quiz is easy and you can retake it during your 90 day Enrollment Period if you need to– check your Enrollment Agreement for details. Getting your certificate and driving record. Free certificate delivery. After you finish a Course, you’ll receive a Certificate of Completion that you can send to your insurance provider and to the Court that issued your ticket, as applicable. Remember to call the Court for mailing instructions—the phone number will be on the ticket. Some California Courts allow for the certificates to be sent directly to them. We inform you when this is the case and how it is done in the applicable Course Introduction. In a hurry? Express certificate delivery is normally available for an extra charge. Just send in your request for overnight delivery any time before 10 a.m. (Central time) on the day you finish a Course – allow one full business day if you order after 10 a.m.
Order your Texas Driver Record. Courts in Texas will also usually want a copy of your Texas Driver Record. Click on Get my Texas Driver Record for easy instructions. In a hurry? You can get your Texas Driver Record Here with two day express delivery for $43.98. Ready? Then click on Get Started and we’ll help you find the right Course and register. SAFETY-USA® guarantees your satisfaction—if you aren’t happy with the Course and choose not to finish it for any reason, you’ll get a full refund for up to three days after enrolling – check your Enrollment Agreement for details. We’re State and Court approved. Safety-Ed™ Courses are approved by the State of Texas as well as many Courts in California for the dismissal of traffic tickets. Just click on Get Started to find your Course, Course prices and further details. Companies can save even more $$$. We can help you save on insurance and repair costs. SAFETY-USA® can custom-design programs to fit the specific risk management needs of our corporate and fleet customers. Get a volume discount by enrolling in Safety-Ed™. To learn more, email us at fleetsupport@SAFETY-USA.com or call us at 1-800-980-2175 .